With In Search of Good Form, Joseph Zinker emphasizes seeing and being with as keys to a phenomenological approach in which therapist and patient co-create and mutually articulate their own experiences and meanings. He considers Gestalt field theory, the Gestalt interactive cycle, and Gestalt concepts. "This is a rich and generous book. It is full of wisdom without being pushy, humane without being maudlin, instructive without being dull, clear without oversimplification. Zinker's discussion of the theory and practice of working with couples and families is itself an embodiment of good form. Both neophyte and seasoned professional of whatever theoretical persuasion are likely to enlarge their appreciation for the beautiful drama of working with couples and families as a consequence of reading it." "I've never heard a Gestalt therapist so clearly articulate aesthetic principles, while at the same time embedding these principles in concrete examples and practical suggestions. In Search of Good Form is extremely practical for practicing therapists, while also being philosophically interesting and original." "In this age of 'managed' care when therapy is being thought of more as a business than a profession, Zinker brings a fresh artistic perspective to couple and family therapy. Not only does he provide a useful, down-to-earth theoretical method, but he tells us how and when to intervene." Wheeler, Foreword. Part I: Theory. Our Common Ground. In Search of Good Form. Systems: Couples and Families as Holistic Phenomena. The Interactive Cycle. Awareness and Change. Resistances to Contact. Boundaries and Boundary Management. Part II: Practice. Intervening in Couple Systems. Intervening in Family Systems. Lying and Truthfulness in Intimate Systems. Loss, Grief, and the Use of Ritual. Conclusion: The Aesthetics of the Gestalt Approach. Joseph C. Zinker, Ph.D., is a founding fellow of the Gestalt Institute of Cleveland, where he served as chair of the postgraduate training faculty. He teaches the Gestalt model of couple and family therapy in workshops and training programs throughout the world. 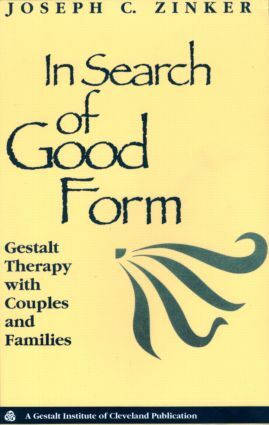 His previous book, Creative Process in Gestalt Therapy (1976) remains a classic work in the field.